I was thinking more of the Philippine Flag (sun rays as my necklace, o diba? ), but Paul and Angel thought I dressed up as Wonder Woman. Pwede na din--first day naman ng showing ng Avengers, lol! Before anything, let me (awkwardly) greet The Fashionista Commuter blog a HAPPY 3rd BIRTHDAY! Super saya that back then I wouldn't even tell my friends about this blog, and now I gained MORE friends because of this online tambayan. 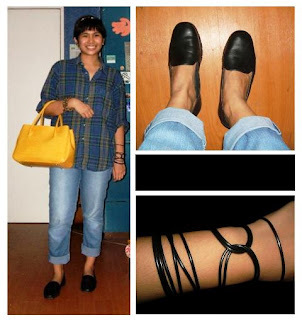 Now, tignan niyo naman ang first entry ko (and outfit pics!) - Hehehe! I miss my black hair haha! To more years, cheers? CHEERS! Accompanied my blog friend Angel to a lunch and makeover session she won through Blood Rush. I also met the pretty and cool Blood Rush blog kids: Celine, Jay, and Afianne! Vegetarian spring rolls na bagay sa "special sauce"
My favorite, the fried rice! :) I love flavored rice talaga. After the heavy lunch, headed to Azta Urban Salon (still in ATC) for Angel's makeover! Ombre-ing an already cool shaved head! Doble dobleng cool na? Lol! Angel enjoyed the dry shampoo thingie, only by Azta! A photo with the stylish and sweet Afianne, before leaving Angel and Alabang for more ganaps that day! Tired from a whole day of happenings (separate, and together), but still, managed to go crazy and mag hiritan pa ng wagas inside a quiet restaurant. Hahaha! ....AYYYY sabi ng di nako hihirit e hahahaha! I love the dress! I want to reserve one too, kaso not sure if it'll fit me. I love love love stars! I hope that I can grab your dress once you sell it. :D Keep up the nice work on the blog! Happy 3rd birthday! Thanks Arnie for always following my posts, and for telling me I look "youthful" hahaha :)) See youuu!